Recent discoveries suggests that Google is experimenting with local inventory ad placement above the local 3-pack. These ads mirror the Local Pack in format and structure, with two ad listings resulting from some product searches. Not only are these listings sporadic, but they seem to appear only as a result of local searches conducted on a smartphone, demonstrating Google’s continued focused on local-mobile search. This is not the first time that Google has experimented different ways of displaying results for local product searches. 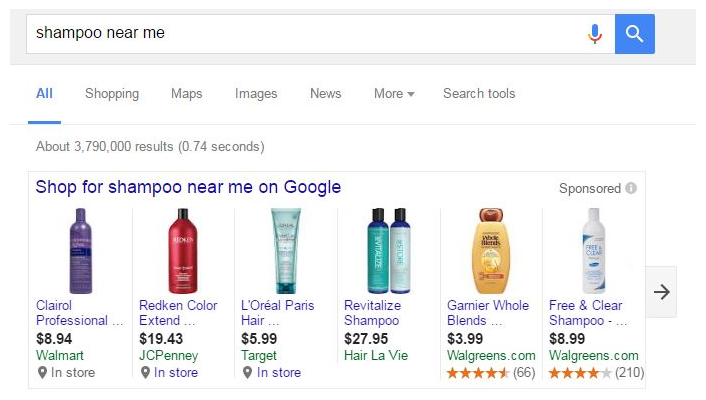 Google’s Possum update last year displayed product search results in a carousel-like reel of ads, as shown below. 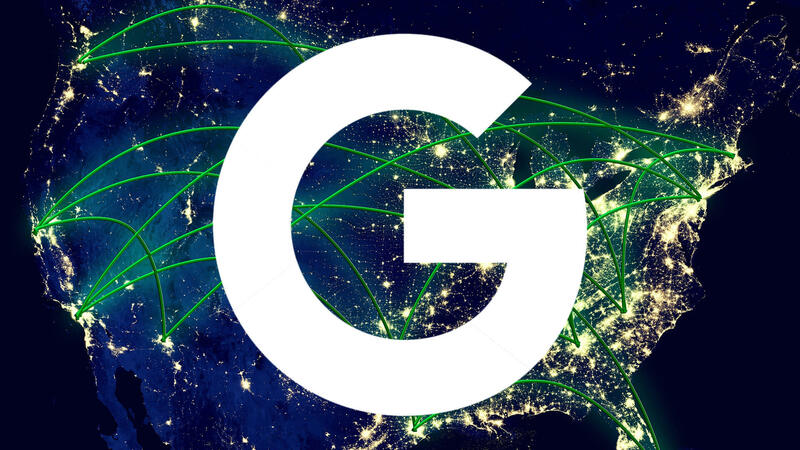 As local search intent continues to increase, Google has been working hard to meet user expectations by experimenting with the local search results and providing users with a list of nearby stores that carry the products they seek. Now, as discovered by Mike Blumenthal, these local product ads are mirroring the Local 3-Pack, with two packed ads above the Google Adwords ad, and the organic Local 3-Pack as a third card below. 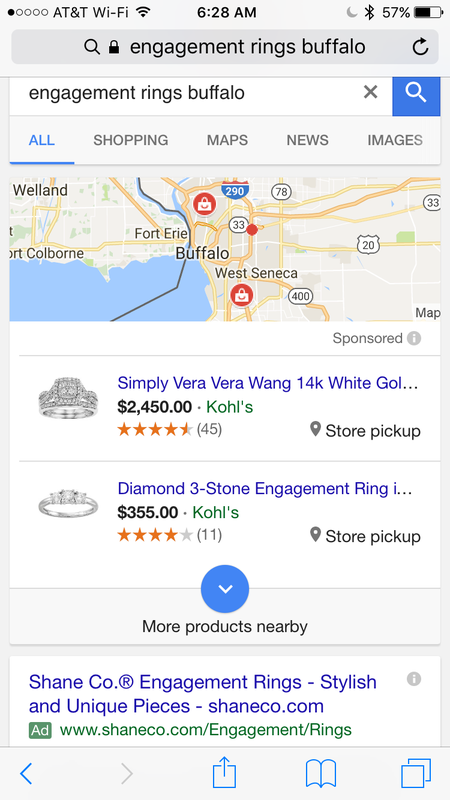 Clicking on either of the ad listings in the local ad pack directs the user to a local inventory ad landing page hosted by Google. As shown above, this format places the organic search results below the fold on mobile, which has some marketers concerned about brand visibility. Yet, this ad structure appears in only a fraction of local-mobile search results, and is likely to stay that way, even if Google rolls out this feature permanently. 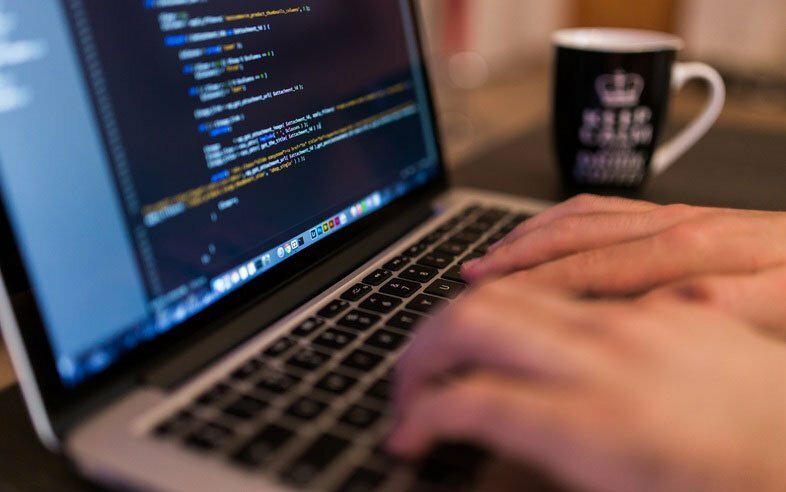 These ads will depend on situations such as a user’s proximity to the nearest location with sponsored content, a user’s keywords and phrasing and whether a brand has sponsored content for the product search in question. 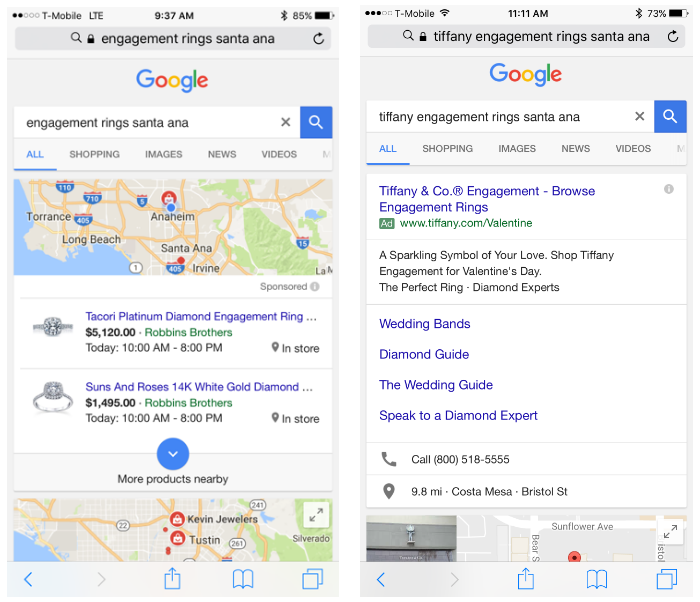 Brandify conducted similar queries for both non-branded (left) and branded (right) engagement rings, and the branded search results did not display the Local Pack ad reproduction. Thus, marketers should not have to worry about being pushed down the SERP on branded queries. The probability of being pushed down the SERP on general queries should be few and far between with such a heavy dependence on factors such as proximity, product specifications and content relevance. For enterprise marketers who have struggled to rank organically, the availability of the local ad pack will be an opportunity for brands to strengthen their online presence and connect with consumers at the local level by providing contextuality and value through actionable advertisements. Brands that want to continue ranking organically, or that hope to improve their organic rankings, need make sure that location data is clean and accurate, local listings have been claimed and updated, and that reviews are prominent, consistently monitored and addressed as necessary. Google is constantly evolving in an effort to provide the best possible experience to its users. This means providing relevant local search results that include complete and accurate information with peer-reviewed content to aid users in completing their intentions. Ultimately, Google is making a major shift toward mobile optimization, as evidenced by its recent mobile-first index and increased focus on Accelerated Mobile Pages (AMP). Google recently reported that the majority of its searches take place on mobile. With nearly half of all U.S. search queries holding local intent, Google is making local-mobile searches even more of a priority in 2017, and there are likely many more tests and changes to come. Start preparing for the upcoming Google search changes by determining your location data accuracy score across the serach giant; and gain a deeper understanding of your brand's presence, as a whole, with Brandify's free Quick Scan audit below.